According to HitsLink, Internet Explorer lost about 8% of market share to Firefox and Safari in 2008 and IE6's market share decreased from 32% in January to 20% in December. There's a big opportunity to provide an alternative to IE6 users and many websites recommend users to update their browsers for a better experience. 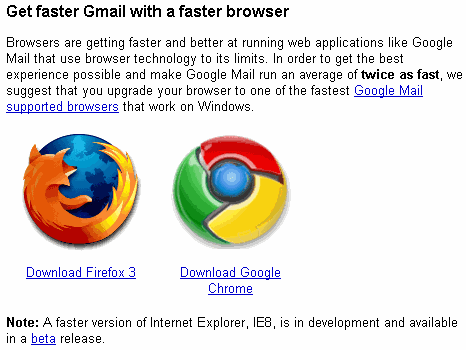 For example, Gmail showed a message which informed users that Firefox and Chrome load Gmail twice as fast as IE6. "Browsers are getting faster and better at running web applications like Google Mail that use browser technology to its limits. In order to get the best experience possible and make Google Mail run an average of twice as fast, we suggest that you upgrade your browser to one of the fastest Google Mail supported browsers that work on Windows," says a Gmail help page. Internet Explorer 6 users miss the most important Gmail features launched in 2008: themes and Gmail Labs, while the new version of Gmail has been launched for IE6 in September 2008. As Matt Cutts says, "Chrome has already encouraged lots more people (both browser makers and website owners) to pay attention to things like browser speed, overall user experience, and cross-platform/validated HTML code that works on most browsers". Firefox attracted Internet Explorer by offering better security, maybe it's time to make performance a good reason to switch. 1. Switch to a more secure browser. 2. Get a faster browser. 3. Web pages will look better. 4. Use a browser that it's not closely integrated with your operating system. 5. Try a browser that has native support for Ajax. 6. Open less windows by using tabs. 7. Get a search box without installing toolbars. 9. Web developers will thank you. 10. If IE6 is no longer a popular browser, developers will spend more time releasing new features. I don't know if you saw this, but I thought it was pretty interesting as well: http://googleonlinesecurity.blogspot.com/2008/07/are-you-using-latest-web-browser.html . When you read something like that you start to look at the upgrade-prompts that your browsers are showing with a more critical eye. Why do some browsers make it so complicated to upgrade and so easy to stay on obsolete versions? I'm really glad Chrome goes the other way and just makes sure that the browser is up to date all the time. Another interesting point is that with that message on gmail, to update browser, it actually allowed me to install chrome on computers at college, bypassing any admin control features. "Opera is not fully supported by Gmail"? I've never run into any trouble. It might be true I don't usually use Gmail's web interface. Primary browser at home and work is FF3. My company is still installing IE6 internally - we're a reasonably secure environment. A few folks have gone IE7 but slowly, as there are a couple of internal apps that didn't play well with IE7 and are just now getting fixed but only for IE7, not FF. I use FF3 and IE8 Beta a home and am happy except when I VPN into work. One of our apps doesn't work with IE8 and probably won't for another year at least - maybe when IE8 comes out of Beta. Sometimes use Mozilla Prism for Google Calendar and Maps, seldom use Chrome - don't like the way it presents. Just two questions: Has anybody else had to downgrade from IE7 to IE6 to get a printer or some other hardware to work?? Does anybody else have an occasional problem getting Google Chrome to backup to previous pages?? Opera is not in the list of supported browsers, even though Gmail works well in Opera 9.5+. Chrome has some issues with navigation to previously visited pages. For example, there's a bug related to form submission. I find some of the comments here fascinating, especially in combination. My comments here are to offer perspectives not represented above. "I'm really glad Chrome goes the other way and just makes sure that the browser is up to date all the time." Go ask a major IT org if updates are never bad. Or just read further: "there are a couple of internal apps that didn't play well with IE7.." "Has anybody else had to downgrade from IE7 to IE6..." One can take the easy route by just bashing Microsoft and IE6, but every software upgrade has the potential to break things. That's why every IT org keeps tight control of the updates going to the desktops they support. Then there's this fun comment: "allowed me to install chrome ..., bypassing any admin control features." Holy cow! Is it seriously considered a good thing that Google bypasses organizational restrictions? I remember the uproar from IT people and others when Chrome was released with this "insecure by default" feature. I've also seen some mention of Chrome getting plugins, which I assume will also bypass security. I always see statements like "IE6 wasn't able to..." as sour grapes. IE6 certainly has problems. However, an engineer's job is to figure out how to make something work. I've never heard a good engineer say something is impossible, just that it takes more resources. Google's IE6 statement sounds to me like they meant 'it wasn't worth the effort required' but instead they decided to go into attack mode and bash a competitor. I'm working on a startup with my partner, and we decided right from the get-go that at least until we get funding and more manpower, we probably will not be supporting IE 6. 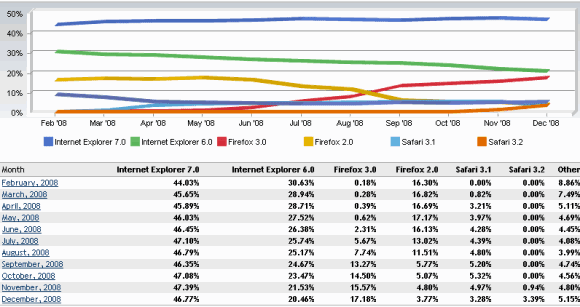 I hope that the number of IE 6 users will decline further, and supporting it will be come even less of an issue. I still don't understand which browser should I call the best. Firefox - Updated, fast, bugs get fixed fast. Not much Vulnerability. Safari - Still in Beta stage for me, and doesn't appeal much when it comes to Java applications getting stucked. Flock - Great for social tagging and keeping all things at ease. But built on Firefox engine anyways. Chrome - Getting better everyday. Still many bugs. So still I can't decide and judge which browser could be my recommendation for others. 5) Absolutely hate tabs with a passion!!!!!!!! I think its ok with google chrome particularly in case of captcha codes typing work, rest I do not have commandable knowledge of Information Technology.